Will the Self-Driving Google Car Change Insurance Forever? Will the Self-Driving Google Car Change Driving and Car Insurance Forever? We have seen stories about Google’s self-driving car for ages but it was only recently revealed to the world. All this time, the pictures shown have always contained a normal car with cameras and sensors and things stuck on it. However, it turns out that they were working on a unique self-driving car all the time. It looks a bit like a toy car and while some people seem to hate its looks, others have called it cute. This isn’t a conventional type of car, though. In fact, it is so different from the rest that it is worth considering whether it will change driving and car insurance forever. It seems safe to say that every single person who steps into a Google self-driving car for the first time will be surprised. We will know that it’s an autonomous vehicle but it will still be a shock to see no steering wheel, no pedals and no other typical driver controls. How will you feel about getting driven around in a car like this? It sounds like good fun but at the same time slightly worrying. The bosses at Google confirm that they made a conscious decision to leave out all driver controls because they felt that it would be safer. This is because of the natural reaction of many people to grab the controls if they felt the car was in danger. The results released so far by Google have been impressive, with the very few accidents reports all being put down to human error (in conventional cars with driver controls). Theory suggests that self-driving cars are safer because they won’t make the mistakes humans can due to being tired or distracted. Their computers will look at the street logically and work out what the best course of action is in each case. Once the streets are filled with self-driving cars the world should theoretically be a more orderly place. There is no doubt that this vehicle will change the way we view driving. If you currently love to get behind the wheel then you might hate the idea of sitting there as a passenger all the time. However, anyone who can’t drive or who has health problems could find that it changes their life in a positive way. Currently, the top speed is only 25 mph but this is about getting around safely rather than tearing down the motorway. It might not be fast but being driven around by an autonomous car has got to have a fun sort of novelty feel to it at first. 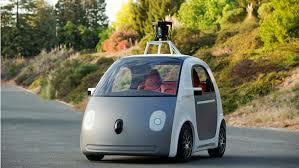 What we don’t know yet is how the Google car will affect the future of car insurance. After all, if the human inside it has absolutely no control over what it does then how can they be expected to take responsibility for any accidents? If you had a Google car and it crashed you would be a bit upset about it affecting your no claims bonus through no fault of your own. It seems safe to suggest that some sort of insurance will be needed as we can’t discount some other mishap happening to it. Will it be a group 1 insurance car, as the only real risk should be of theft rather than an accident? Will there be some sort of group policy that Google or the distributor has to pay, to make sure that money is there is for some reason one of the cars injures someone? It looks like we’ll need to wait and see for the answers to these questions.